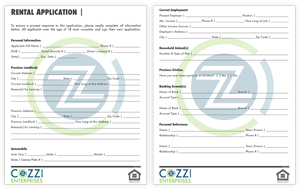 Tenant Resources - Cozzi Enterprises, LLC. Whether it's one of our multi-unit apartment buildings or a single-famly house, we know that you'll find your new home in one of our rental properties. So, what do we need before you can move-in? After you’ve found an apartment that meets your criteria, call or contact us to schedule a tour of the property. One of our knowledgable staff will meet you on-site & answer any of your questions. If you're ready to get started on the paperwork, you can download & complete our <a href="http://www.rentalsforme.com/wp-content/uploads/2014/09/rental-application.pdf">rental application</a>. The application takes only minutes to complete and, along with a small deposit, it reserves your new apartment! In our FAQ section, we have compiled & answered many of the most common questions tenants have about living in our apartments. Please feel free to call or contact us if you have any questions or concerns which were not addressed. Are tenants allowed to keep a pet in their apartment? Yes, each of our residential units are pet-friendly. However, we do not allow aggressive dog breeds. Are tenants required to purchase renter's insurance? We strongly suggest that tenant's purchase a policy to insure their personal belongings, but it is not required. When should I expect to have my security deposit returned? Barring the need for repairs, tenants will typically receive their security deposit 30 business days after vacating. To whom do I make my rent check payable? What utilities are tenants responsible for maintaining? Tenant responsibilities vary by location; refer to your lease or call an agent for clarification. May I sublet / assign my lease to someone else? No, tenants are not permitted to sublet their unit to another individual.